I am probably going to see Jordan Peele’s Us this weekend. Not happy about this. Us is getting strong reviews. Get Out was not a fluke. So it’s not like I’m going to walk out of there all like, what a sh-t movie. I will probably walk out with sh-t in my pants though because scary movies are not my thing. I only watch them out of professional obligation, like the time etalk assigned me to the Conjuring junket. It was happening on the same weekend as Pacific Rim. So if I wanted to interview Idris Elba and Charlie Hunnam together, I also had to sit through The Conjuring. THIS IS LIFE. It gives and then it takes. A Jordan Peele movie – even though it’s his second movie – is now a cinematic event. He’s so good at his job it’s now my job to cover his job. So Us is going to be a matinee and then I’m going to chase it when I get home by watching this trailer over and over again. 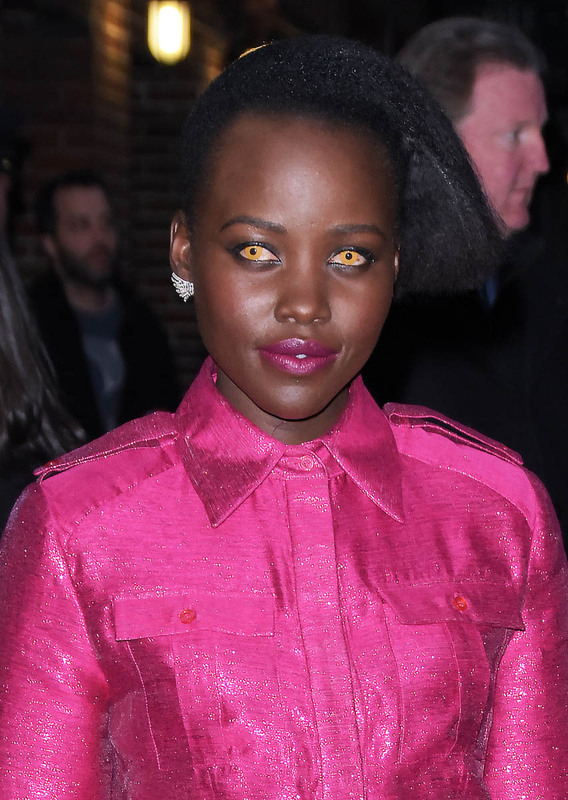 Here’s the star of Us, Lupita Nyong’o, in New York yesterday determined to freak us all out with those eyes. She did it last week at the premiere in London and, while it’s a scary trip to look at, I appreciate that she’s incorporating the horror element into her promotional wardrobe. Colour contact lenses like this are not comfortable – because they’re temporary, not meant for every day use but for costuming, so they’re typically sold without customisation. Lupita is a celebrity, sure, and maybe she had hers special ordered. But if they weren’t, if they were bought the way we buy ours for Halloween, she probably couldn’t wait to take them off at the end of the night. Not that she would tell you that because part of the costume is to keep up the character and if we know Lupita, she’s excellent on a press tour. On this press tour in particular, since people are already starting to talk about her performance and awards prospects, she’s been killing it. I love her interview with E!, especially the way she described her working relationship with Jordan, how she had to tamp down the “reverence” she has for him because it gets in the way of creativity. There’s so much respect there but also an acknowledgement that the best way to show respect is to do your best work – and this isn’t easy, when you’re working with a mentor, someone you admire so much. Getting to that place is work in and of itself. At the end of this interview, there’s a quick question about that possible Rihanna collaboration, remember? It was an idea that started on Twitter after they were at a fashion show together and they tweeted back that they’d be into it and then Issa Rae jumped in about writing it and Ava DuVernay was like, I’m here to direct and since then we’ve heard nothing and Lupita’s response when asked? "I can tell you absolutely nothing about that." It’s hard to read what’s behind that smile, what it actually means – are they working on it, are they not telling us until they’re good and ready? But it must be something right? She wouldn’t be playing it like this, like there’s so much she can’t say, if there was nothing, right?